Futuremark hat heute seine neuesten 3DMark Time Spy Benchmark-Ergebnisse veröffentlicht: Die neue Radeon RX 480-Karte von AMD schneidet bei DirectX 12-Tests am besten ab. Futuremark® has today released its newest benchmark, 3DMark® Time Spy, and Radeon™ graphics results further demonstrate AMD’s performance leadership in DirectX® 12. 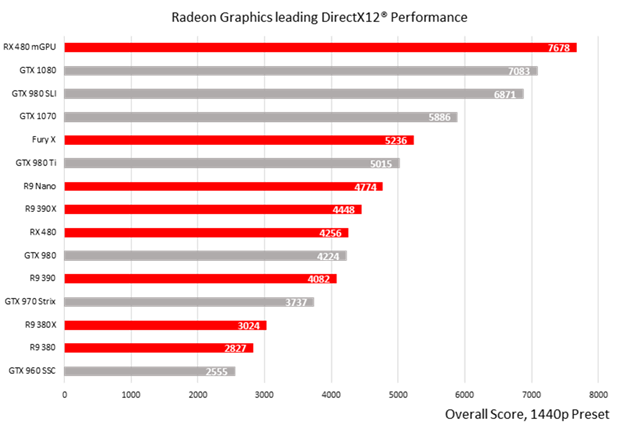 AMD has secured the pole position in the DirectX 12 era, building out its roster of DirectX 12 games, many of which are extensively tuned for the Graphics Core Next and Polaris architecture. The DirectX 12 ecosystem is rapidly expanding as developers adopt the low-overhead API. With its wide range of industry partnerships, AMD has led DirectX 12 performance for the vast majority of game titles and benchmarks, including Ashes of the Singularity™, Hitman™, Total War™: Warhammer and the Total War™: Warhammer DX12 benchmark build, Quantum Break™, Gears of War™ and Forza APEX™. Multi-Threaded Command Buffer Recording: Multi-threaded command buffer recording opens up a wide communication lane between your AMD processor or APU and your AMD Radeon™ GPU – so more than one CPU core can talk to the GPU at a time. With DirectX® 11, most of the graphics work was loaded onto one core. DirectX 12 mGPU: DirectX12 mGpu enables incredible multi-GPU warfare with higher framerates, lower input latency, capacity for higher image quality and more.